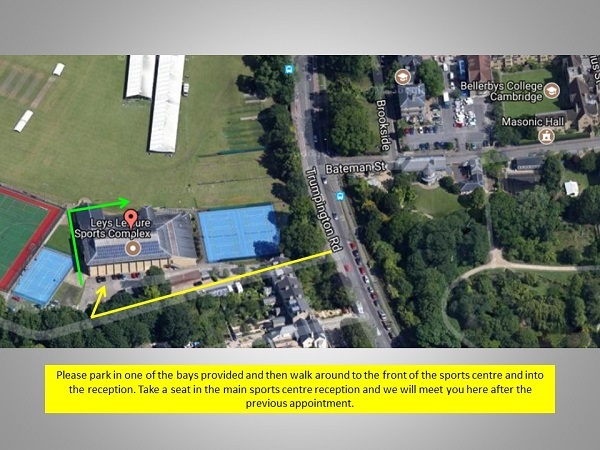 Please note that there are three entrances to The Leys but please enter via the sports complex entrance which is opposite Cambridge Botanical Gardens on Trumpington Road. If coming from Fen Causeway, turn right at the mini roundabout to enter onto Trumpington Road and then go past two sets of pedestrian traffic lights prior to turning right into The Leys entrance (just past Bateman Street). If coming from Brooklands Avenue, turn right to enter Trumpington Road and then pass a small meadow and a few houses on your left prior to turning left into the first The Leys entrance you see. Free parking is available once you have entered and then please walk around to the sports complex reception and take a seat. Passing the Cambridge Retail Park on your right, continue along Newmarket Road until you reach the stadium which is located on your right hand side. Just past the stadium you will see a set of traffic lights – IMMEDIATELY BEFORE them, take a right turn down a gravel road. Please note, you will turn left into the gravel road IMMEDIATELY AFTER the set of traffic lights before reaching the main stadium car park. Enter the Cambridge United car park through the metal gates. The F.A.S.T. 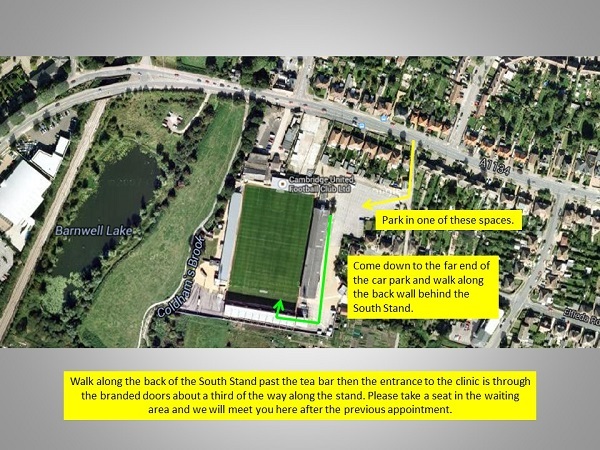 clinic is located within the South Stand which is the stand with the lettered seating at the far end of the ground. You can park in any of the spaces and there are bike racks to the left inside the car park. Walk right to the bottom of the car park, past the pitch on your right hand side. Walk along the back wall behind the South Stand. The clinic can be found approximately a third of the way along the stand through the branded double doors just after the Tea Bar. Take a seat in the waiting area through the double doors and we will be with you after the previous appointment. 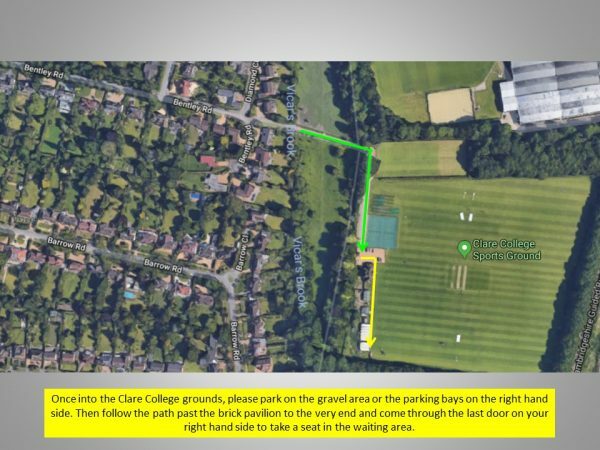 Please note that there are three entrances to The Leys but please enter via the sports complex entrance which is opposite Cambridge Botanical Gardens on Trumpington Road. If coming from Fen Causeway, turn right at the mini roundabout to enter onto Trumpington Road and then go past two sets of pedestrian traffic lights prior to turning right into The Leys entrance (just past Bateman Street). If coming from Brooklands Avenue, turn right to enter Trumpington Road and then pass a small meadow and a few houses on your left prior to turning left into the first The Leys entrance you see. Free parking is available once you have entered and then please walk around to the sports complex reception and take a seat. Travel along Trumpington Road and turn down Bentley Road which is opposite the Golf Course. Continue straight at the bottom of Bentley Road to enter into Clare College sports ground. Free parking is available here; it is best to park either on the gravel or in the parking bays on the right hand side. Then walk along the path past the front of the brick pavilion. The clinic waiting area can be found through the last door on your right hand side at the bottom of the path. Please take a seat in here.